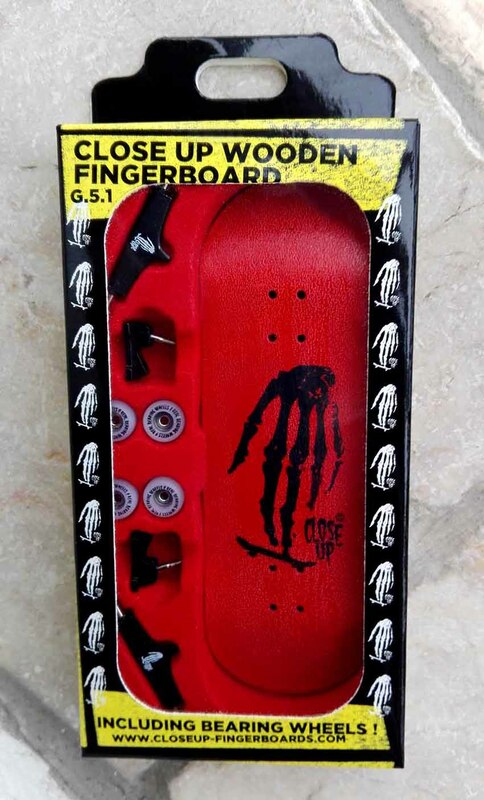 This complete wooden fingerboard set up includes a real maple plies 33 mm wide deck, high concave, with our famous Close Up Skull Hand logo, CNC quality bearing printed wheels, painted & printed trucks, tool and all nuts, screws, bushings, washers necessary to assemble it your own. A rectangle rip tape to cut your own is also included under the deck + Close Up fingerboards stickers. Are those trucks size 29 mm in this set? Yes Adam, there are exactly 29mm long! thanks for confidence and support! Do you ship to New Zealand, and how much? Bonjour Nico, nous avons un article représentant 5 rip tapes en 29, 30 et 31mm et allons suggérer un “Repair Kit” contenant 4 rip tapes, 1 kit outils, gommes, visseries, écrous et rondelles pour les trucks, d’ici à 24h dans la rubrique Obstacles et All products. Merci pour votre patience, votre confiance et votre support. Do you guys ship to Brazil, and how much? We ship to Brazil for 6 € any complete Fingerboard box, but if order includes a bench or coffin curb, shipping will be 20 €. Obrigado for confidence and support. L(outil de montage est inclus dans tous es packs complets. Merci pour votre support. Diferences about high and low concave? Oh nice, I was thinking in buy this one. I had some wood decks before but nothing professional. So i’m a little bit beginner. Thanks! Oh, sorry, I forgot to answer. It is no longer necessary! A friend of mine gave me two that he had from an old Berlin Wood (I think, I honestly do not remember the brand xd).